Baleen whales are the largest animals that have ever lived on our planet. 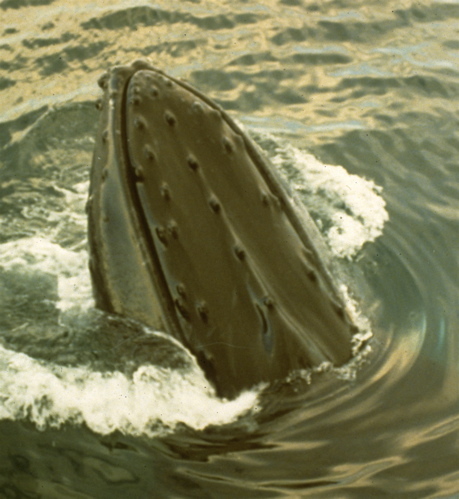 They include such giants as the blue whale, fin whale and humpback whale. 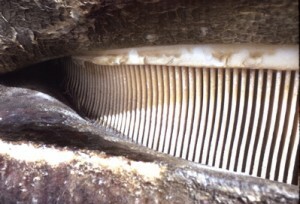 Baleen whales do not have teeth, but have a series of strainers in their mouth called baleen. The baleen is used for catching and filtering out schools of fish and plankton from the water. 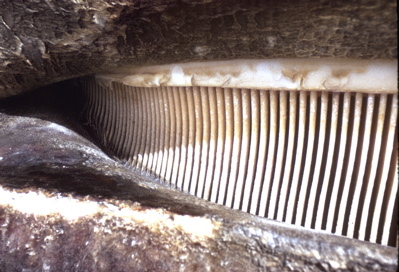 A baleen whale may have up to 400 baleen plates on each side of its upper jaw. Baleen is not a tooth; in fact it feels more like a fingernail. The length of the baleen varies with the species of whale. The baleen of a minke whale, a fish eater, is less than six inches long, while the baleen of a right whale gets up to 12 feet long. 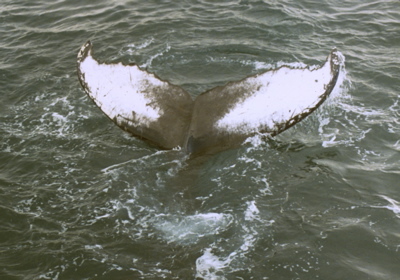 The right whale feeds by skimming plankton living near the surface of the water. 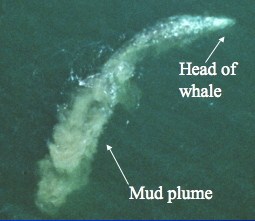 The gray whale lives off of the Pacific Coast and is rarely found more than a mile from shore. The Gray was hunted to near extinction in the 1870’s, but has fully recovered from whaling and now has a population of over 21,000. In the winter, the gray whale breeds in the shallow water lagoons of Baja California, Mexico. In the spring, gray whales migrate up the Pacific Coast and spend the summer feeding in the shallow waters of the Bering and Chukchi Sea of Alaska. The gray whale has the longest migration of any mammal on earth; a round trip journey of more than 10,000 miles. 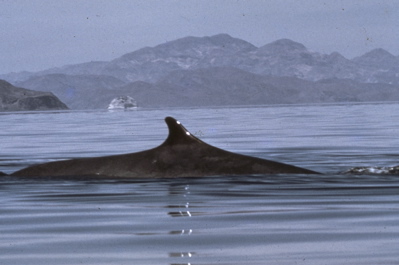 Fin whales grow to 80 feet in length and weigh over 80 tons. They are the second largest mammal on earth. 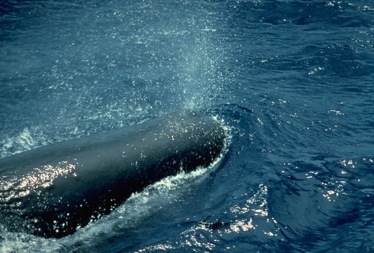 Fin whales feed on small fish and stay submerged for six to eight minutes. Since they are fast, agile swimmers, they were not hunted by whalers until steam ships were invented in the late 1800s. is the largest animal that has ever lived. A blue whale grows to a length of 100 feet and a weight of 110 tons. The heart of a blue whale is the size of a Volkswagon “beetle” car and the aorta (the largest blood vessel in the body) is so large that a child can crawl through it. The eye of a blue whale is the size of a grapefruit and a baby could crawl into the blowhole of a blue whale. The call of a blue whale is the loudest of all animal species, and will carry more than a thousand miles in water. 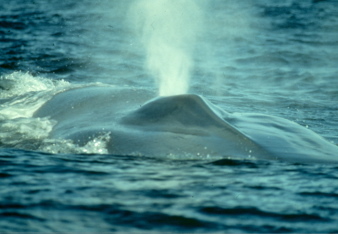 The blue whale is an endangered species, which was hunted in the Antarctic to near extinction. In 1931 alone, 29,000 blue whales were slaughtered in Antarctic waters. 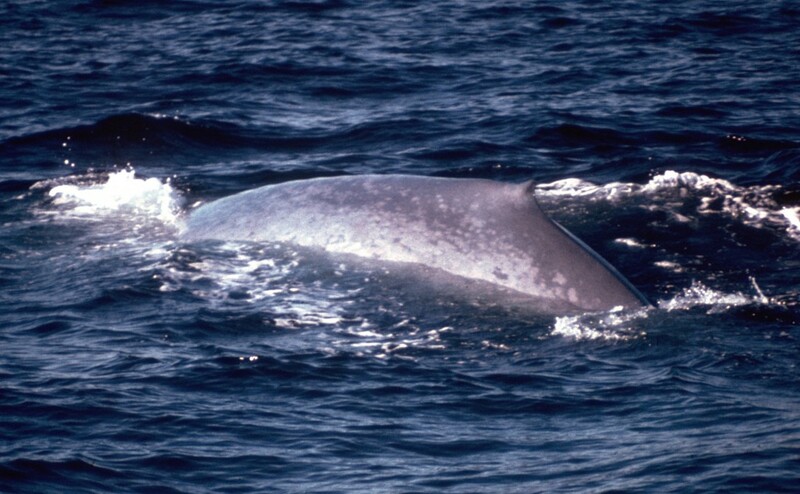 A recent Antarctic population survey estimates that less than a thousand blue whales remain. Even though the world-wide population is dangerously low, the number of blue whales is increasing in the North Pacific and North Atlantic oceans. Blue whales feed on krill (shrimp-like plankton), eating up to four tons in a day. When a blue whale is feeding its takes enough water into its mouth to fill a living room. The ventral pleats (on its underside) expand and fill with water. Blue whales can dive for 10-12 minutes at a time. Humpback whales get over 50 feet long and weigh 50 tons. The humpback has been studied more than any other whale on Earth. Researchers discovered 40 years ago that the underside of the flukes of each individual humpback has a unique pattern that allows the whale to be identified throughout its life. Humpbacks are also a favorite of whale watchers because they exhibit so many interesting behaviors in the water. The whale on the right is “spyhopping”. 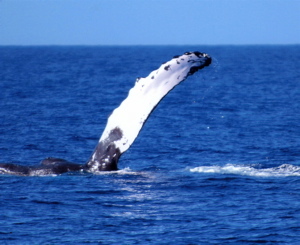 Humpbacks can also be seen breaching, flippering (photo below), and lobtailing. 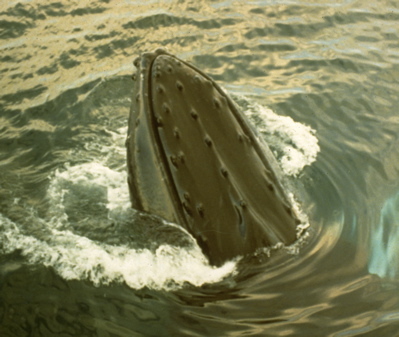 Whalers named them “humpback” because as they dove, their backs “humped up”. Most baleen whales are endangered, but their populations are increasing today. There has been a world-wide ban on whaling since 1984. Humpbacks in the North Atlantic have fully recovered from whaling, even though they had been hunted for 400 years prior. However, there are other dangers to whales today: being struck by ships, tangled in fishing nets, water pollution, and their natural predators, orca whales. Toothed whales include many well known species of whale including the orca whale, bottlenose dolphin and sperm whale. As the name implies, toothed whales have teeth that are used to catch and hold small fish and squid. Generally speaking, the front of the head is round and is called the melon. 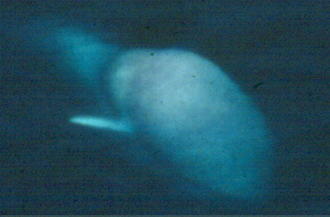 The melon is an oil filled cavity and allows a toothed whale to echolocate (to perceive its environment by using sound). Toothed whales can be found in large schools of over 1000 animals. known as a melon. The melon helps the whales use sound (echolocation) as a means for locating food and communicating with each other. There are over 100,000 belugas living in Arctic waters. 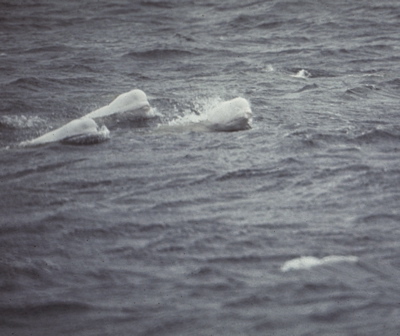 On the Alaska side of the Arctic, belugas are not classified as endangered species. 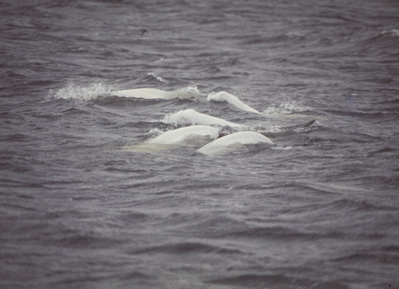 Along Baffin Island and Hudson Bay, Belugas have been over-hunted by Eskimos (Inuit) and are classified as endangered. In the Gulf of St. Lawrence, Quebec, Canada, there exists a small population of Belugas (400 animals) that will be probably become extinct in the next twenty years because of the pollution in the Great Lakes and St. Lawrence Rivers. Belugas eat eels that have been in the Great Lakes and are polluted with many different types of poisonous materials. Orcas are a “top predator” in the oceans (nothing eats them) and are extremely important in controlling animal populations. The orca is also known as the “killer whale” because it has been observed killing other types of whales, dolphins and seals. Orcas are the only type of whale to feed on other marine mammals. They also eat salmon, tuna and other large fish. A male orca gets up to 30 feet in length and a female can be as long as 25 feet. 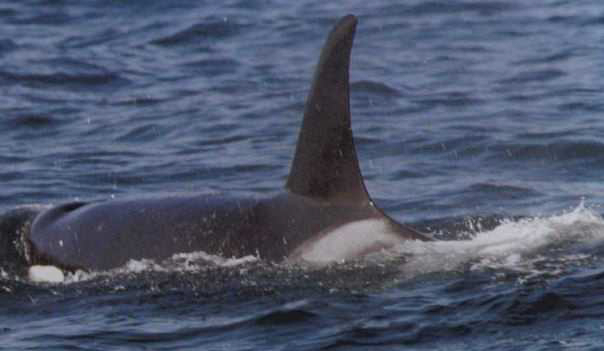 An orca lives with the same pod (group) all of its life. The pod is made up of a family group that includes the oldest female and offspring from several generations which are both male and female. 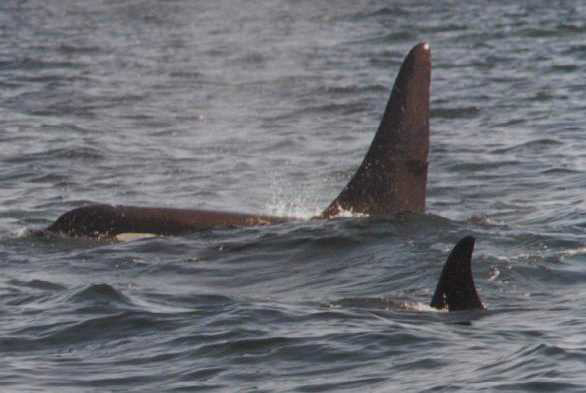 The only time an orca leaves the pod is to breed with members of other pods. Years ago, it was believed that the larger orca bull was the “alpha” whale (the “boss” or the whale in charge) of thepod. But over the years, researchers have discovered that it is actually the oldest female who is the “alpha” whale. Orca whales become sexually mature when they are 14 years old. Orcas are pregnant for 14 months before they give birth. An Orca female will have an average of five calves during her lifetime and not produce any more calves after the age of 40.
for several years. In 1990, the tuna companies agreed to buy only tuna that was not caught with dolphins (now called “dolphin-safe tuna”). This has helped protect both spinner and spotted dolphin populations. 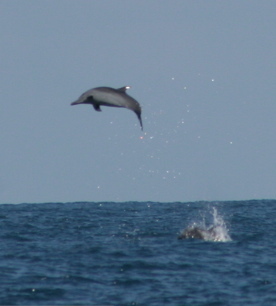 Spinners are known for their great ability to jump high out of the water. 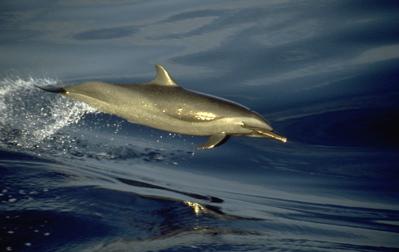 The common dolphin or “white-belly” grows to seven feet long. It is found both in tropical waters and off the California coast. “White-belly” schools can be composed of over 3000 dolphins. 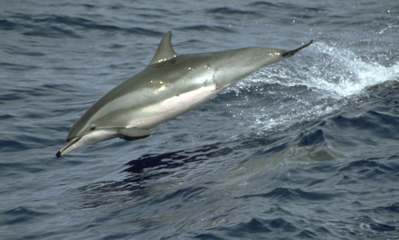 Common dolphins can dive to depths of 900 feet to feed on herring, anchovies, and squid. Common dolphins are also found with tuna schools, but they have developed an ability to avoid tuna nets. This has earned them the name of “untouchables” among tuna fisherman. The sperm whale is the largest of all of the toothed whales. A bull sperm whale can get up to 60 feet long and weigh up to 50 tons. Female sperm whales are very social and they live in family groups. The family group takes care of the calves. If “mom” dives to get some food, another member of the pod will protect the calf from attacks by killer whales or sharks. The young males stay with the family until they are about six years old and then leave the family. As they get older, the males gradually move to colder waters. 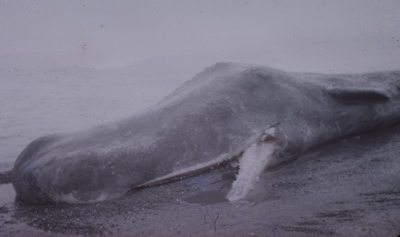 The young whales and females are mainly found in and near the tropics. The really large bull males may be found alone near the polar ice. These large males return to the tropics to mate when they are over 25 years old. 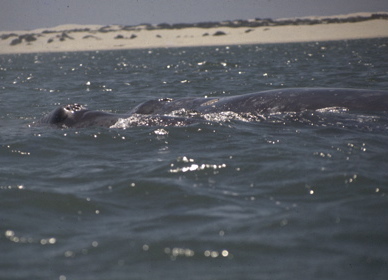 Sperm whales have been tracked during their dives with fish finders or sonar. The average dive of a sperm whale is 40 minutes. They go nearly straight down at a rate of 4-5 miles/hour to over 1200 feet (400 meters) beneath the surface. Then they level out and go along at that depth for a half an hour, before returning to the surface. Sperm whales have been hunted primarily for the oil in their melon. In the past hundred years alone there were several hundred thousand sperm whales killed by whalers. However, population studies show that sperm whale populations are increasing and there may be a hundred thousand whales worldwide. Bottlenose dolphins are commonly found in marine aquariums. In the wild, they are common in both coastal and offshore waters. Many behaviors of bottlenose dolphins could be characterized as “play”. 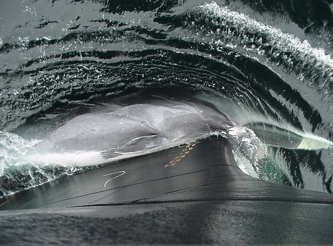 For instance, they commonly bow-ride the front of ships and breach (jump out of the water). Some inshore groups herd prey and drive them on to the shore. The dolphins then temporarily beach themselves, pick the fish off the shore, and then slide back into the water. Wild females, as old as 45 years, have given birth and raised a calf to weaning. Calves stay with their mother for up to two years. The harbor porpoise is found in coastal waters and river estuaries. Harbor porpoise populations have dramatically decreased over the years, due to the pollution of coastal waters and becoming tangled in fishing nets. Harbor porpoise appear to be very short-lived, with few individuals surviving beyond 12 years. The head is blunt, without a beak, and the back is gray with a triangular fin. 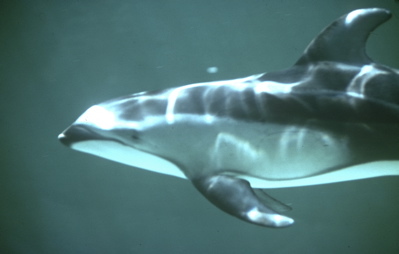 Harbor porpoises are usually shy and do not approach boats. a loud sneezing sound as it breathes; this has been compared to that of a “puffing” pig. The main diet of the harbor porpoise is small schooling fish and squid. Gretchen Steiger, Robin Baird, John Calambokidis, and Alexei Calambokidis. I would also like to thank my life-long friends and researchers, Jim Cotton and Paul Kelly, for the generous donation of their photos. Lastly, I would like to thank the Maslowski family, of the Gatewood School community, for donating their photos of the humpback whales. Blue Whale Surfacing, Monterey Bay, CA.